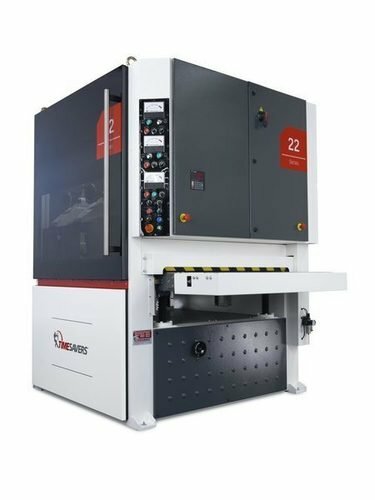 The 22 series can be configured for metal finishing or deburring at an affordable price, with many standard features that other companies only offer as options. This versatile and compact group of machines is available in three widths 900 mm, 1100 mm and 1300 mm and from one to three heads in a combination of drum and brush heads. The machine is designed for low cost deburring for metal cut and laser, as well for edge rounding and process foiled parts. Timesavers International is based in Goes, The Netherlands, with regional of- fices around the globe in Shanghai (China), Taichung (Taiwan), Kuala Lumpur (Malaysia) and Timesavers Inc. in Minneapolis (USA). Worldwide the company has more than 200 employees supported by a network of local dealers and partners. In the 76 years of their existence, they have built and sold over 55.000 machines, with customers in nearly all countries over the world. 24 نموذجVew المزيد عن Timesavers International B.V.
B & B Machinery Co.
2964 Northeast Pkwy N. E.
Wm. J. Redmond & Son, Inc.
HDM & INNOWEMA G. Föckler e.K. Shanghai Weixie Machinery Co., Ltd.